The people in Spain are not used to ride around on a bike. Many big cities have only a couple of cycle lanes. Valencia however, has a lot of green areas, slow traffic streets and of course cycle lanes in and around the historical centre, which makes Valencia a very cycling friendly city. Outside of the cities there are a lot of good roads which you can take, but they are usually full of traffic. To avoid heavy traffic you can always look for some nice secondary roads with are located along your route. These roads usually have less traffic on them and run directly through nature. Be sure that you have a good map of the area with you when you decide to leave the main roads. About 16 kilometres south from Valencia you will find the Albufera Nature Reserve where you will find the largest lake of Spain. Its location by the sea and freshwater rivers feeding into it has created a paradise for lots of migratory birds. This area is also the centre of the Spanish rise industry. On the way to El Palmar, were you can take a boat trip over the Albufera Lake, you will come across the rise fields and ride through beautiful nature all on cycling friendly roads. Because of the short distance it’s ideal for a family cycling trip. The road to the village of L’Orxa is a more difficult journey, but equally interesting. On your way to the village of L’Orxa you will ride through the beautiful village of Villalonga, come across a valley filled with orange trees, drive along the river Serpis, ride through typical Mediterranean landscapes and pass by the castle of Perputxent, mainly cycling on quite gravel roads. A though journey, but really worthwhile. Of course there a lot more beautiful places to discover in the Valencia region then the ones mentioned above. If you didn’t bring your own bike it does not mean you can’t go cycling in Valencia. You can always go to one of the cities bike rentals and hire a bike for a day. 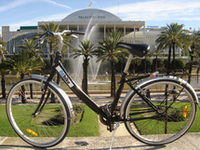 Some bike rentals also offer the opportunity of guided individual tours of guided group tours. Tip: if you are going for a long ride, bring enough water! Near Valencia there are some mountain areas perfectly suited for real heavy off road cycling activities. If you want to go mountain biking in the Marina Alta region, some experience and a healthy physical condition are required. Many years ago the Moorish cut many small and bended trails through the mountains of the Marina Alta region using them as travel routes. Nowadays these trails are nothing more then rocky tracks mainly used by off road bikers looking for a trill ride. To follow these tracks you will have to do some heavy climbing and cross some narrow tracks. You can easily get a flat tire while cycling on sandy and rocky tracks and it can just as easily been solved if you brought the proper tools. When you go out mountain biking it’s always wise to bring along a small toolkit to sure that you are prepared any small bike problems. You don’t want to be forced to stop your adventure because of something small as a flat tire. At the start of every professional cycling season many Pro-Teams send their best riders to Valencia to prepare them for the upcoming big challenges like the Giro d’Italia, La Vuelta a España and the Tour de France. This 5 day cycling event is held at the end of February / the beginning of March ever year and is considered as one of the toughest cycling challenges of the pre-season, because of the difficult mountains the riders need to climb. The first edition of this race took place in 1929 and was won by a Spaniard called Salvador Cardona. In 2006 the race will be held for the 64th time. Most edition of this challenge were won by Spaniards but the last couple of years more and more great foreign riders (for example: Hinaut, Ekimov, Zülle, Jalabert and Vinokourov) won this event, which shows that the Vuelta cyclista de Comunidad Valencia has became an important international championship. Professional cycling is known as a peoples sport. It’s one of the few sports that offers you the opportunity to see your heroes from up close while they are competing.